"A free application for burning your CDs and DVDs, including Blu-Rays and HD-DVDs." 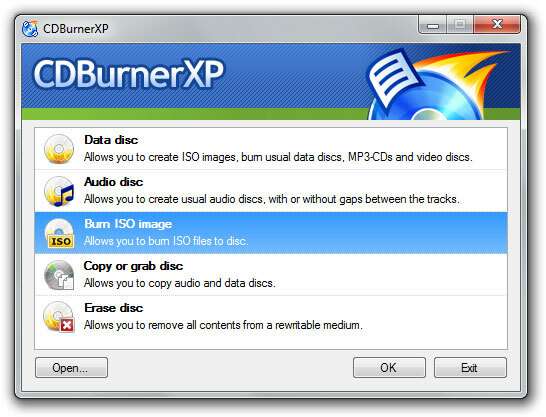 A free application for burning your CDs and DVDs, including Blu Rays and HD DVDs, CDBurnerXP is a simple application that serves its purpose when it comes to burning all of your content on to the discs of your preference. While being a CD burner, you can also create ISOs, as well as a multi language interface. This software is completely clean, has no ad ware, or malicious components with in the application. With this application you are given the ability to burn all kinds of discs with any sort of content that you want. This includes applications, DVDs with your movies or videos, audio CDs with your music content, and ISO installation discs for backing up your important application installation discs. You can also burn audio CDs with or without gaps between the tracks, which is an interesting feature. The software will make sure your content was burned successfully with data verification after the burning process. This will make sure that your content did not get corrupt in the burning process, which can some times happen when the write speed is a bit too fast for the content you are burning on to the disc. 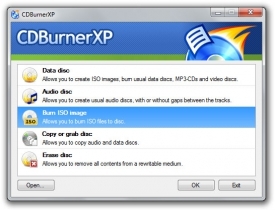 You can also create bootable discs with CDBurnerXP. The application also conveniently comes with a .BIN/.NRG to .ISO converter to enable you the ability to burn the ISO files on to the disc which is a much more common image type.